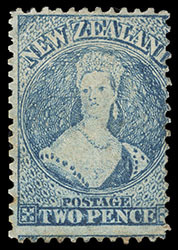 New Zealand, 1864, Queen Victoria "Chalon Head", 2d pale blue, perf 13, N Z watermark, unused without gum, strong color and impression, light lower right corner crease and some faint perf toning, scarce and Fine appearance. Scott No. 28C. Campbell Paterson No. A2j (X). SG No. 105 £1,200 ($1,580). 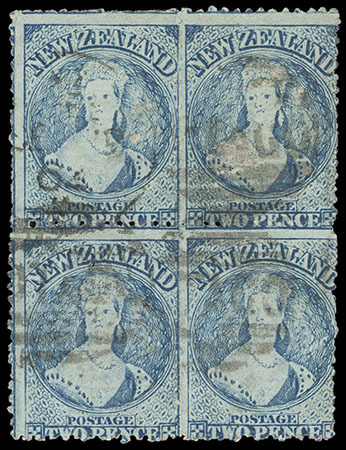 New Zealand, 1864, Queen Victoria "Chalon Head", 2d pale blue, perf 13, N Z watermark, block of four (R. 18-19/4-5), cancelled by partial strikes of Dunedin "Otago" duplex, strong intact perfs, small flaws including two tiny paper slits in bottom left stamp, F.-V.F. appearance, a very rare multiple, Joseph Hackmey, Spink Shreves, February 2009, lot 1351. Scott No. 28C. Campbell Paterson No. A2j (X). SG No. 105 Estimate $500 - 750. Joseph Hackmey, Spink Shreves, May 2010, lot 2333; with 2006 Odenweller (clear) and 2007 R.P.S.L. certificates. Scott No. 30C. Campbell Paterson No. A6h (Y). SG No. 106 £1,500 as singles ($1,970). Joseph Hackmey, Spink Shreves, February 2009, lot 1354; with 2006 R.P.S.L. certificate. Scott No. 30C. Campbell Paterson No. A6h (Y). SG No. 106 Estimate $1,000 - 1,500. Overpaid 1d for the 11d rate for a ½ oz. 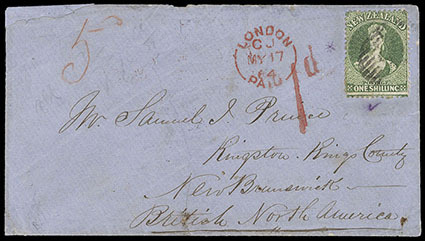 letter to the British North America via Suez and Southampton. It was easier to use one stamp instead of multiples of lower values. References: Illustrated in Odenweller as fig. 8.6, p. 117.